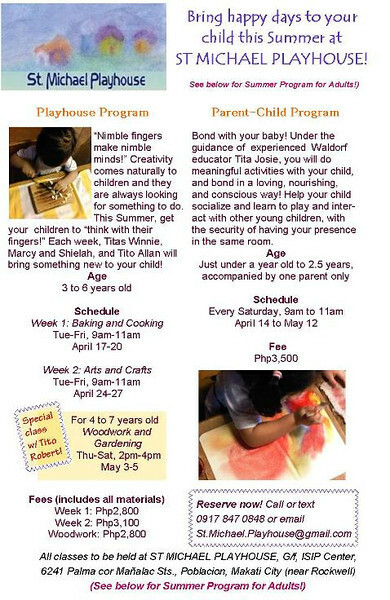 St. Michael Playhouse will be holding special classes for both parents and kids this summer. First, there are these classes for the parents. 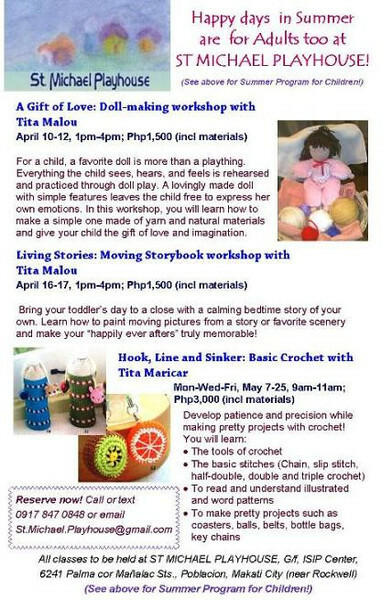 I intend to attend the living storybook workshop because I feel it would help with the homeschooling stint. Hopefully though, there will be someone I can leave the kids with on those dates. I am darned sure he'd love the woodwork and gardening sessions. I can't really enrol him in the other classes because I intend to have him and Yamee take swimming classes as usual. He's actually been asking already why he isn't going to swim school yet. :) This would be his 4th year and Yamee's first. Hopefully, I can manage their schedules.